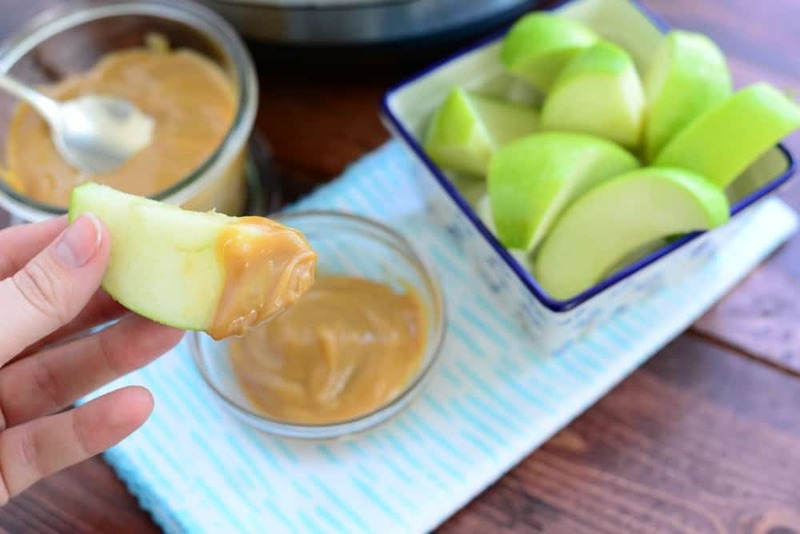 Try this Dulche de Leche Instant Pot recipe the next time you want add some homemade caramel to your favorite dessert or make a simple caramel dip for sliced fruit. 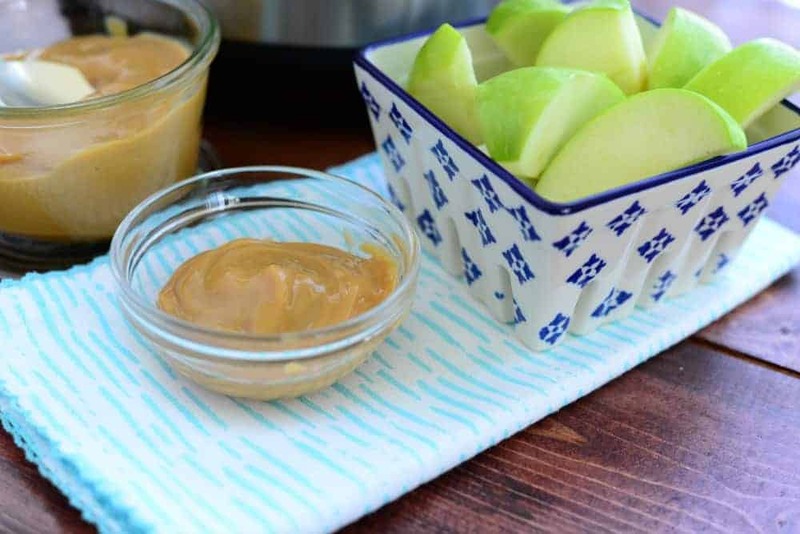 In fact use this with some sliced apples for a simple caramel apple treat. Or if you are like me, you might even consider just eating it plain, by the spoonful! This homemade caramel sauce recipe is so easy to make using nothing more than a can of condensed milk and your Instant Pot or other pressure cooker. Making your own Instant Pot Dulche de Leche is so much better than the store bought versions and costs so much less money too. Plus you get to control the ingredients and can make sure there are no extra junky ingredients added. Like I mentioned above this is just a can of condensed milk and that is it! SO easy!! All you will need for this recipe is one 14oz can of sweetened condensed milk . I like to use the Eagle Brand myself, but any sweetened condensed milk will work. 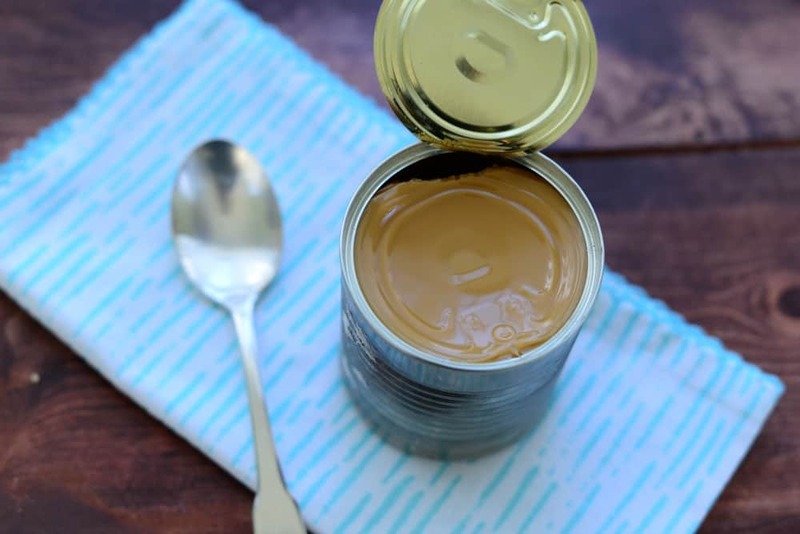 Take some time to check out your can of sweetened condensed milk. Check to make sure your can isn’t dented or broken in a way. If it is you can transfer contents inside the can to a mason jar and put the lid on. The can will also be under pressure inside the instant pot. So don’t attempt to move or open it right away until it has cooled down. 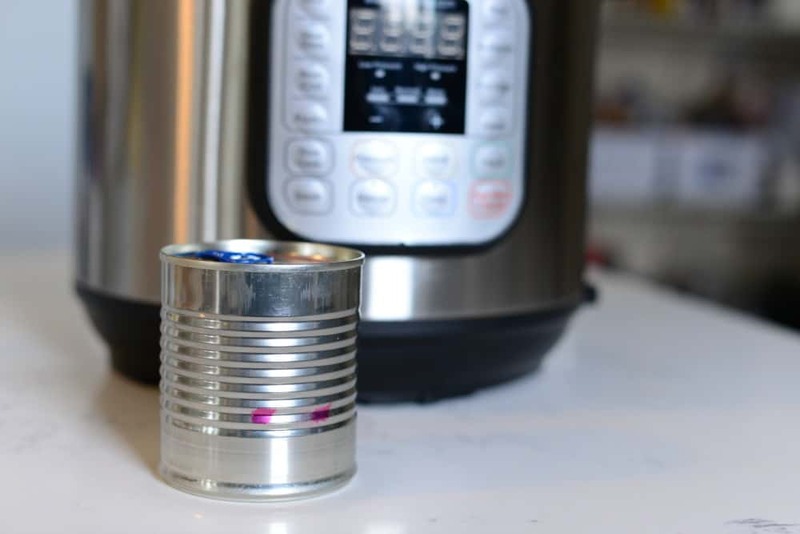 You will also want to get off any paper on the can that you can and make it as clean as your able, before placing it inside the Instant Pot pressure cooker. Once all of the paper has been removed and you are sure your can is in good condition, you can move onto the next step. 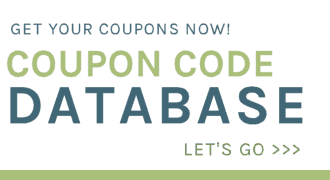 Now it will be time to make sure your Instant Pot is ready to go. 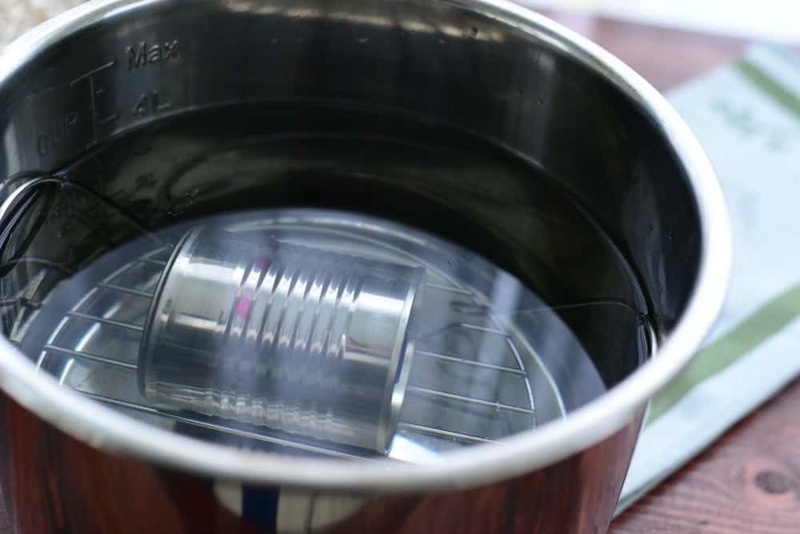 Pull out your Instant Pot and place the metal trivet into the bottom of the metal pot. Place the can of sweetened condensed milk on top of the trivet, laying on its side. Start to fill up the pot with water. You will need to add enough water to be able to cover the can while it’s laying on its side. Make sure that the can is fully submerged in the Instant Pot. Once your can is in the middle of your pot and completely covered with water, you can go ahead and close your lid and make sure the vent is closed also. Now push the manual button, should be high pressure, and set for 15 minutes. This is the hard part, walk away. You will want to let it naturally release completely on its own when it is done. Do not remove the can. You will want to let the can and instant pot sit for awhile until the water has cooled down almost completely. The can will still be warm after the water has cooled down. Now remove the can and place in the fridge, to finish cooling down. Let the can cool completely before opening it to avoid any under pressure contents inside. You might just want to let your can sit overnight to be on the safe side of things. Once it has cooled completely you can open it up and use it right away or put it into a container to use later. Caramel Apple Taquitos – this homemade caramel would taste so much better than the store bought caramel that I used in this recipe. Bread Pudding with Homemade Caramel – You can use your homemade caramel in place of the caramel sauce in this recipe. Caramel Apple Baked Donuts – Use this dulche de leche instead of the topping that is included in this recipe. Caramel Apple Crisp – This is an old family favorite recipe! You could also just drizzle this over everything from ice cream to oatmeal. SO good! I just know there will be lots of caramel in heaven. What other recipes can your think of that this caramel sauce would taste great with?